Be the first to share your favorite memory, photo or story of Betty "Kaye". This memorial page is dedicated for family, friends and future generations to celebrate the life of their loved one. 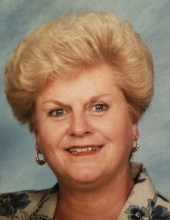 Betty “Kaye” (Jones) Mozingo, 74, wife of George Mozingo, went to be with the Lord on Saturday, February 2, 2019 surrounded by her family in her home. Kaye was born on September 12, 1944 in Mt. Olive, NC, a daughter of the late Eddie and Esther (Guy) Jones. Kaye was a loving and devoted wife, mother, “Nana”, and friend who will be missed beyond words by her family and everyone who knew her. She was a member of Verona United Methodist Church and retired in December of 2009 from James Madison University with over 29 years of service as College of Business Secretary. Her courage, strength, and sense of humor were amazing. She loved and cherished family and made Sunday dinners, holidays, and vacations extra special. In addition to her parents, Kaye was preceded in death by two sisters, Sadie Smith, Peggie Rouse and twin brother, Eddie Ray Jones. She was the last surviving member of her immediate family. Surviving in addition to her husband of fifty-five years, is a daughter, Lisa Floyd and husband Steve of Staunton; two sons, Eddie Mozingo and wife Dana of Harrisonburg; Johnny Mozingo and wife Christy of Fort Defiance; seven grandchildren, Derek and Jordan Shifflett, Matthew and Katie Mozingo, Lauren, Casey, and Drew Mozingo. A Memorial service will be conducted at 11:00 a.m. Saturday, February 9, 2019 in the Verona United Methodist Church by Pastor Bob Weeks. The family would like to offer a special “Thank You” to the Augusta Health Hospice of the Shenandoah, especially nurse Beverley Brown. They would also like to thank Dr. G. Adam Campbell and Dr. Ziv Haskal for their care and compassion shown to Kaye. It is suggested that those desiring make memorial contributions to Verona United Methodist Church, P.O. Box 47, Verona, VA 24482 or Augusta Health Foundation Hospice of the Shenandoah, P.O. Box 1000, Fishersville, VA 22939. To send flowers or a remembrance gift to the family of Betty "Kaye" (Jones) Mozingo, please visit our Tribute Store. "Email Address" would like to share the life celebration of Betty "Kaye" (Jones) Mozingo. Click on the "link" to go to share a favorite memory or leave a condolence message for the family.